When the Census Bureau released its report on state- and district- level school spending a few weeks ago, news outlets across the country made futile attempts to compare the return on investment of their local school districts with those in neighboring states. Because education lacks standard accounting practices, fairly comparing per-pupil expenditures across states is next to impossible. What constitutes per pupil expenditure in one state is different from another, and how expenditures are reported depends on who's doing the reporting. If you are a superintendent looking to find more money for your schools, you can report the number in a way that makes them look underfunded. If you are a state legislator looking to send less money to public schools, you can report the numbers in a way that makes them look overfunded. If you're a taxpayer interested in how your tax dollars fund your local school, well, you're out of luck. Determining per pupil expenditure relies on a series of decision rules that vary. Should states report current expenditure or total expenditure (which includes capital outlays and debt services)? Is expenditure the total revenue collected and disbursed to the public schools, or the amount that the district actually spent? Perhaps most importantly, the method you use to calculate costs affects the final total. To highlight the discrepancies that can exist, I compiled three different calculations of per pupil expenditures from five large, well-known school districts (based off data from the Census Bureau Report). As you can see from the right-most column, the per-pupil expenditure varies widely depending on how cost is calculated. This is not acceptable. What if we discovered that a private company had changed the way it calculated costs to overstate its return on investment? Remember Enron, anyone? In order to prevent such malfeasance, our friends in the accounting community have developed a tool called GAAP, or Generally Accepted Accounting Principles, that hold companies to the same standards. If an investor has a question about the stats of a company, he or she can have confidence in the analytic reports that are produced because they must conform to a universally agreed upon standard. When a norm established by GAAP is violated and numbers are no longer trusted (as was in the case of Arthur Andersen watching Enron), accounting firms go out of business. The American Institute of Certified Public Accountants starting regulating themselves in 1887, and today GAAP is defined by a non-profit organization, the Governmental Accounting Standards Board. Education stake-holders could benefit from this kind of streamlined accountability. Education finance needs GAAP, desperately. Discussions about stretching the school dollar and return on investment depend upon it. States cannot learn from each other if they are using separate cost calculations. It appears that our friends in the business world realized that it was in everyone's best interest to make decisions based on accurate information. Some people have used that information to make bad decisions and lost their shirts, others have used it to make millions. At minimum, there has been a level playing field by which to base their investments. In the end, that is what we want for schools as well. Data extracted in July 2017. Most recent data: Further Eurostat information, Main tables and Database. Planned article update: July 2018. This article presents statistics on education finance in the European Union (EU) and forms part of an online publication on education and training in the EU. Expenditure on education may help foster economic growth, enhance productivity, contribute to people’s personal and social development, and help reduce social inequalities. Within the EU, the proportion of financial resources devoted to education is one of the key choices made by national governments. In a similar vein, enterprises, students and their families also make decisions on the financial resources that they are able or willing to set aside for education. This article covers various aspects of education finance, namely different sources of funding (such as funding by the government or by households), as well as education expenditure by educational institutions or households. It covers pre-primary to tertiary levels of education, in other words expenditure on all levels of education except for early childhood educational development (as defined by the International standard classification of education (ISCED) level 01). Among EU Member States, the funding of education mainly comes from government, with a smaller role for private sources (including households, enterprises, non-profit organisations and religious institutions), while an even smaller role is generally played by international organisations (such as the United Nations or the World Bank). It should be noted that some government expenditure relates to the transfer and payments for education to the non-educational private sector — this includes subsidies to households and students as well as payments to other non-educational private entities. As such, this part is counted twice, once in government expenditure and a second time in the expenditure of households and other non-educational private entities. Whenever government expenditure includes payments and transfers for education to the non-educational private sector, this is denoted as ‘public expenditure’. Figure 1 shows the relative expenditure on education (excluding transfers and payments) from the three main sources of expenditure, namely, that made by government, non-educational private sources and international organisations. The government’s share of total spending on education in 2014 ranged from just less than 72 % in the United Kingdom and Portugal up to more than 95 % in Romania and Sweden, averaging just over 80 % across 23 of the EU Member States (see Figure 1 for coverage). Non-educational private sources contributed just over 18 % of total expenditure on education across 23 of the EU Member States, with private sources providing more than 10 % of total expenditure on education in 16 of the EU Member States for which data are available, this share rising to 20 % or higher in five of the Member States, and peaking at 25.5 % in Cyprus and 27.7 % in the United Kingdom. The contribution of international organisations to expenditure on education was generally much lower, averaging 1 % across 23 of the EU Member States. Their share was lower than 5 % of total expenditure in all but five of the Member States for which data are available, with Lithuania (10.0 %) and Estonia (14.3 %; 2012 data) the only Member States to record double-digit shares. In 2014, Bulgaria was the only EU Member State which did not record the highest share of its total expenditure on education being devoted to primary and lower secondary education (see Figure 2), as tertiary education accounted for almost one third (32.4 %) of total education expenditure compared with a 28.4 % share for primary and lower secondary education. For the other Member States, the share of total expenditure accounted for by primary and lower secondary education ranged from a low of 35.1 % in Hungary (2013 data) up to more than half of the total in Luxembourg (51.5 %) and Ireland (54.3 %). 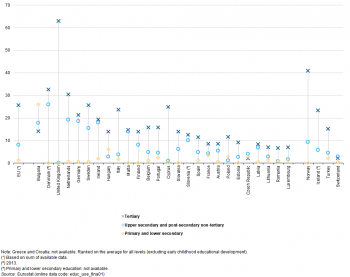 Generally, the smallest share of educational expenditure in 2014 was recorded for pre-primary education, with shares ranging from 2.0 % in Ireland, 5.7 % in the United Kingdom and 5.9 % in Cyprus up to more than one fifth of total education expenditure in Bulgaria and Sweden (both 20.3 %). These latter two EU Member States were both atypical insofar as pre-primary education did not account for the lowest share of education expenditure, as the proportion of spending on upper secondary and post-secondary non-tertiary education was less; Luxembourg also had a different pattern of expenditure, as its share of total expenditure devoted to pre-primary education was higher than that for tertiary education. Expenditure on tertiary education in 2014 was generally higher than the share for upper secondary and post-secondary non-tertiary education, although there were six exceptions: aside from Luxembourg, these included Italy, Belgium, Cyprus, Malta and Portugal. 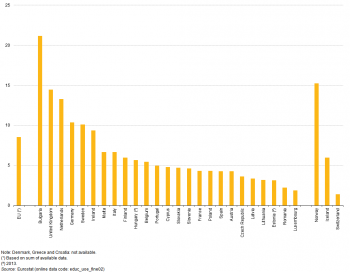 Tertiary education accounted for one fifth to one third of total educational expenditure in all of the EU Member States for which data are available, except for Luxembourg (which was below this range) and Lithuania (which was slightly above it, 34.0 %). Upper secondary and post-secondary non-tertiary education typically accounted for one sixth to one quarter of total educational expenditure, with lower shares recorded in Lithuania and Sweden, while higher shares were registered in Belgium and Italy. Public expenditure on education, in other words, expenditure by the government including payments and transfers for education to the non-educational private sector, totalled EUR 683 billion across 25 of the EU Member States in 2014 (2013 data for Estonia and Hungary; no data available for Denmark, Greece and Croatia). 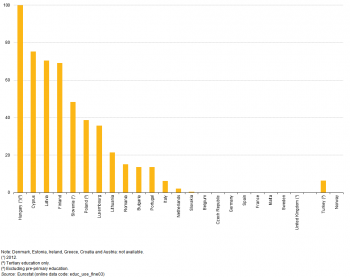 Total expenditure on education in these 25 EU Member States was estimated at 5.1 % when measured relative to gross domestic product (GDP) and 10.6 % as a share of total public expenditure (see Table 1). The highest public spending on education relative to GDP among the EU Member States was observed in Sweden (7.1 %), followed by Finland (6.8 %), while relatively high ratios were also recorded among the northern EFTA members of Iceland (7.0 %) and Norway (6.7 %) — see Figure 3. 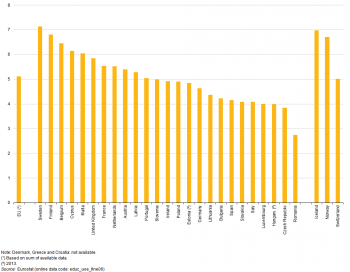 Aside from Sweden and Finland, most of the Member States reported ratios of public expenditure on education relative to GDP that were between 3.5 % and 6.0 %, with only Romania below this range and Belgium, Cyprus and Malta above it. Table 2 presents an analysis of expenditure of educational institutions (either made directly by the institutions themselves or made by government on behalf of the institutions) for 2014. In 6 of the 26 EU Member States for which data are available, capital expenditure exceeded 10.0 % of total capital and current expenditure on educational institutions, peaking at 19.0 % in Latvia, while the next highest shares were recorded in the two other Baltic Member States — Estonia (15.2 %; 2013 data) and Lithuania (14.3 %). By contrast, capital expenditure accounted for 3.3 % of current and capital expenditure in the United Kingdom, and for less than 4.0 % of the expenditure of educational institutions in Cyprus, Belgium and Croatia. In most of the EU Member States the majority of current expenditure in 2014 was spent on teachers’ pay, although such pay accounted for 40-50 % of the current expenditure of educational institutions in France, Slovakia, Finland, Lithuania and Sweden (2013 data), for 30-40 % in the Czech Republic (2012 data) and Estonia (2013 data), and for less than one quarter of all current expenditure in Slovenia (23.7 %; 2012 data). Declining birth rates in many countries have or will probably result in reduced school age populations, which will in turn have an effect on ratios such as the average expenditure per pupil (given that expenditure is held constant). Annual expenditure (from public and private sources) on all educational institutions shows that an average of EUR 12 708 was spent per pupil/student in 2014 in Sweden, with this figure falling to EUR 2 343 in Hungary (2013 data); the level of expenditure was considerably higher (EUR 20 025 per pupil/student) in Luxembourg while it was below EUR 1 500 in both Bulgaria and Romania (see Figure 4). In a small majority of the EU Member States for which data are available (16 out of 26), expenditure per pupil was higher in public institutions than in all institutions. Among the 10 Member States where expenditure per pupil was lower in public institutions the difference was greatest absolute terms in the United Kingdom and in relative terms in Estonia (2013 data). 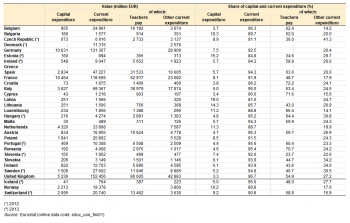 With the exception of Cyprus, expenditure on public and private educational institutions per pupil was highest among tertiary education institutions. A majority of EU Member States reported that their lowest level of expenditure per pupil was for pre-primary education, although there were several exceptions, most notably Sweden and Finland, but also Croatia, Slovenia, Bulgaria, Hungary (2013 data), Luxembourg and Poland; aside from Bulgaria, in each case the lowest level of expenditure per pupil for these exceptions was recorded for upper secondary and post-secondary non-tertiary education. Otherwise, the general pattern observed was one whereby expenditure per pupil/student generally increased from the lowest level of education up to tertiary education. In 2014, an estimated 8.6 % of public expenditure on education across 25 of the EU Member States (2013 data for Estonia and Hungary; no data available for Denmark, Greece or Croatia) was used for financial assistance to households or students (see Figure 6); such assistance may take a variety of different forms, including scholarships, public loans and allowances contingent to student status. The share of public education expenditure that was used for financial aid to households and students ranged in 2014 from 1.9 % in Luxembourg and 2.2 % in Romania up to 9.4 % in Ireland; shares above this range (between 10.0 % and 15.0 %) were recorded in Sweden, Germany, the Netherlands and the United Kingdom, while by far the highest share was recorded in Bulgaria (21.1 %). Figure 7 shows information pertaining to the financial aid given to students, as a share of public expenditure for each level of education. 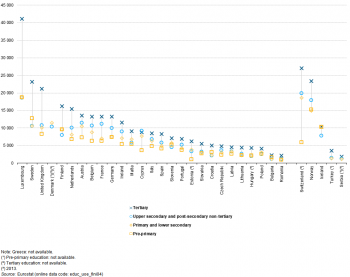 With the exceptions of the Czech Republic and Bulgaria, the share of financial aid to students was unsurprisingly higher for tertiary education than for upper secondary and post-secondary non-tertiary education. 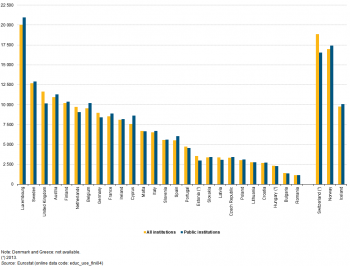 In a similar vein, the share of public expenditure devoted to financial aid for students within upper secondary and post-secondary non-tertiary education was usually higher than the share for primary and lower secondary education, except in Bulgaria, Hungary, Poland and Romania. 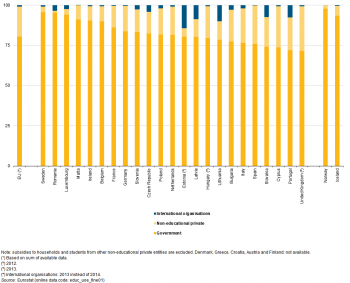 The share of public expenditure on tertiary education used for financial aid to students exceeded 25.0 % in Sweden, the Netherlands, Denmark (2013 data) and the United Kingdom. For upper secondary and post-secondary non-tertiary education, shares of more than 15.0 % were reported for Sweden, Bulgaria, Ireland, Germany, the Netherlands and Denmark (2013 data), while for primary and lower secondary education the shares were generally below 5.0 %, the only exceptions being Hungary and most notably Bulgaria (26.0 %). Figure 8 provides a similar analysis to that in Figure 6, except it focuses on expenditure by non-educational private entities (other than households) rather than public expenditure. As noted above, such entities include for example enterprises, non-profit organisations and religious institutions. The share of total education expenditure accounted for by these entities and destined for financial aid to households and students was much more diverse than that noted for public expenditure; in 9 of the 22 EU Member States for which data are available the share was less than 0.5 %. At the other end of the scale, the relative importance of financial aid provided by non-educational private entities to households and students was particularly high in Finland, Latvia and Cyprus (where it accounted for more than half of total expenditure) and this ratio peaked in Hungary at 100 % (2012 data; the information presented refers only to tertiary education). The source of data used in this article is a joint UNESCO/OECD/Eurostat (UOE) data collection on education statistics and this is the basis for the core components of Eurostat’s database on education statistics; in combination with the joint data collection Eurostat also collects data on regional enrolments and foreign language learning. Regulation No 452/2008 of 23 April 2008 provides the legal basis for the production and development of the EU’s statistics on education and lifelong learning. Two European Commission Regulations have been adopted concerning the implementation of the education and training data. The first, Commission Regulation (EU) No 88/2011 of 2 February 2011, concerned data for the school years 2010/2011 and 2011/2012 while the second, Commission Regulation (EU) No 912/2013 of 23 September 2013, concerns data for school years from 2012/2013 onwards. More information about the joint data collection is available in an article on the UOE methodology. It is also recommended to refer to the specific country metadata before analysing the data presented in this article. ISCED provides a classification for international education statistics, describing different levels of education; it was first developed in 1976 by UNESCO and revised in 1997 and again in 2011. ISCED 2011 distinguishes nine levels of education: early childhood education (level 0); primary education (level 1); lower secondary education (level 2); upper secondary education (level 3); post-secondary non-tertiary education (level 4); short-cycle tertiary education (level 5); bachelor’s or equivalent level (level 6); master’s or equivalent level (level 7); doctoral or equivalent level (level 8). The first results of data collection exercises that were based on ISCED 2011 have been published in 2015 starting with data for the 2012 reference period for expenditure data. Note that in the following key concepts the expression ‘expenditure by or on (…) institutions’ is used for both expenditure by the institutions themselves (for example, salaries paid by a fiscally autonomous university) and expenditure by governments on, or on behalf of, the institutions (for example, salaries paid by a national education ministry directly to individual teachers/lecturers who are employed in public or private schools/universities and other educational institutions). Expenditure for all levels of education combined encompasses the expenditure for all education programmes from pre-primary (ISCED level 02) to tertiary education (ISCED level 8). Total expenditure comprises current and capital expenditure. Current expenditure comprises personnel expenditure and other current expenditure. Total public expenditure on education includes i) direct public funding for educational institutions and ii) transfers to households and enterprises (including non-profit organisations). Generally, the public sector funds education either by bearing directly the current and capital expenses of educational institutions (direct expenditure for educational institutions) or by supporting students and their families with scholarships and public loans as well as by transferring public subsidies for educational activities to private enterprises or non-profit organisations (transfers to private households and enterprises). Expenditure on institutions is not limited to that made on instructional services, but also includes expenditure on ancillary services for students and families, where these services are provided through educational institutions. At the tertiary level, spending on research and development can be significant and this is included in the figures presented, to the extent that any such research is performed by educational institutions. As such, expenditure on educational institutions includes expenditure on core educational goods and services, such as teaching staff, school buildings, or school books and teaching materials, and peripheral educational goods and services such as ancillary services, general administration and other activities. Education expenditure on institutions covers all types of public or private schools/universities and other educational institutions that are involved in delivering or supporting educational services. payments made by government agencies to educational institutions that have responsibility for purchasing educational resources themselves (for example, a government appropriation or block grant to a university, which the university then uses to compensate staff and/or to purchase other resources). Direct expenditure by a government agency exclude tuition payments to an institution that have been received from students (or their families) enrolled in public schools under that agency’s jurisdiction, even if such tuition payments flow, in the first instance, to the government agency rather than to the institution in question. Expenditure on educational institutions from private sources comprises: school fees; materials (such as textbooks and teaching equipment); transport to school (if organised by the school); meals (if provided by the school); boarding fees, and; expenditure by employers on initial vocational training. Public financial aid to students refers to direct public assistance to pupils/students in the form of scholarships, public loans and family allowances contingent on student status. This is not a full measure of the level of assistance students may receive as for instance, students (or their families) may also get financial support indirectly, for example through ancillary services (in other words student welfare services such as meals, transportation, healthcare or dormitories) or tax reductions. depreciation of capital assets is not recorded as expenditure, though repair and maintenance expenditure is recorded in the year it occurs. Expenditure on student loans is recorded as the gross loan outlays in the year in which the loans are made, without netting-off repayments from existing borrowers. 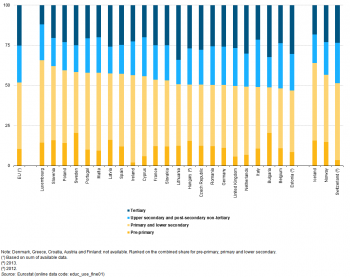 Education accounts for a significant proportion of public expenditure in all of the EU Member States — the most important budget item usually being expenditure on staff. The cost of teaching usually increases significantly as a child moves through the education system, with expenditure per pupil/student considerably higher in universities than in primary schools. Although tertiary education costs more per head, the highest proportion of total education spending is normally devoted to secondary education systems, as these teach a larger share of the total number of pupils/students. There is a debate in many EU Member States as to how to increase or maintain funding for education, improve efficiency and promote equity — a challenge that became harder in the context of the global financial and economic crisis and, in particular, increased levels of public debt. The debate is not purely about the levels and sources of finance, but also concerns proposals for reforms of education policies and systems and raises questions as to the development of labour force skills for the future, for the benefit of individuals and society. Possible approaches to funding include tuition fees, administrative or examination charges; another potential fundraising source is partnerships between business and higher educational establishments. Education costs may be balanced by needs-based or merit-based support: merit-based support includes support awarded on the basis of academic performance; needs-based support includes income-contingent grants, loans (or other support) to try to stimulate enrolment rates in higher education, in particular among the less well-off members of society, thereby promoting equal opportunities as well as social mobility and inclusion. An analysis of national student fees and support systems in European higher education is available in a report produced by the European Commission and the Education, Audiovisual and Culture Executive Agency.